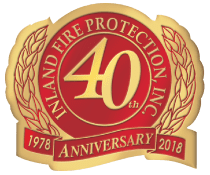 In business since 1978, Inland Fire Protection (IFP) has been providing quality fire protection services to Central Washington and North Central Oregon for 41 years. With offices in Yakima and Wenatchee, we field a professional corps of engineers, sprinkler fitters, and office staff to meet our customer's needs. With custom shop fabrication facilities, field modifications can be met with speed and accuracy to complete projects on time and on budget. We offer a full range of fire protection services, from design and custom fabrication to professional fire supression system installation and maintenance. To learn more about the services we provide, click here.